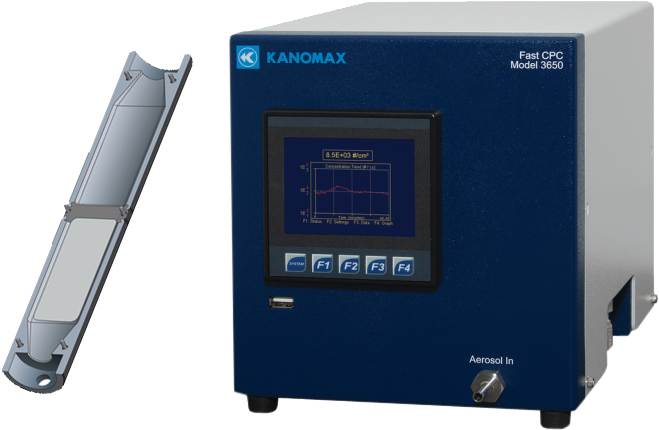 ​The Fast Condensation Particle Counter (FastCPC) pushes aerosol nanoparticle measurement performance to new heights. The FastCPC incorporates a unique wick design using a parallel-plate geometry for the aerosol flow path. Traditional CPC wicks were circular but this new two-piece design achieves the transition from a circular profile to a parallel profile. The patented design creates a shortened flow path and a spectacular 50% response time of 80 ms. The FastCPC’s compact package includes internal sheath and transport pumps with critical orifice flow control. The working fluid in the FastCPC is n-Butyl alcohol and the transport system has been designed to reduce chances of flooding. Kanomax FMT is proud to have some of the best aerosol development engineers in the world. Through their expertise we excel at detecting, sizing, and identifying nanometer particles in fluids. We have filed, and received, numerous patents for our innovative technology. Recent products include the outstanding Scanning Threshold Particle Counter, the Liquid NanoParticle Sizer system, and the new Nano SpotLight System. We are especially proud of our new Fast Condensation Particle Counter its unique wick design presents a remarkable breakthrough in CPC design. Upcoming products include a Drift Tube Ion Mobility Spectrometer (measures rapidly changing aerosol particles from 1-40nm) and a standalone Scanning CPC (three user-selectable sequential size cutoffs (between 7 and 20 nm). Semicon China, Mar 20-22, 2019, China.